VATICAN CITY (CNS) — Members of the military and of humanitarian agencies who risk their lives to save others or to alleviate their suffering are precisely those for whom Jesus will say, “Whatever you did for one of these least brothers of mine, you did for me,” Pope Francis said. For decades, the Geneva Conventions have tried to establish rules to protect innocent civilians in times of war, yet “atrocious crimes” and shocking violations of human dignity continue to occur, the pope told participants at a conference on international humanitarian law. The conference was sponsored by the Italian Ministry of Defense and the Carabinieri, Italy’s military police. 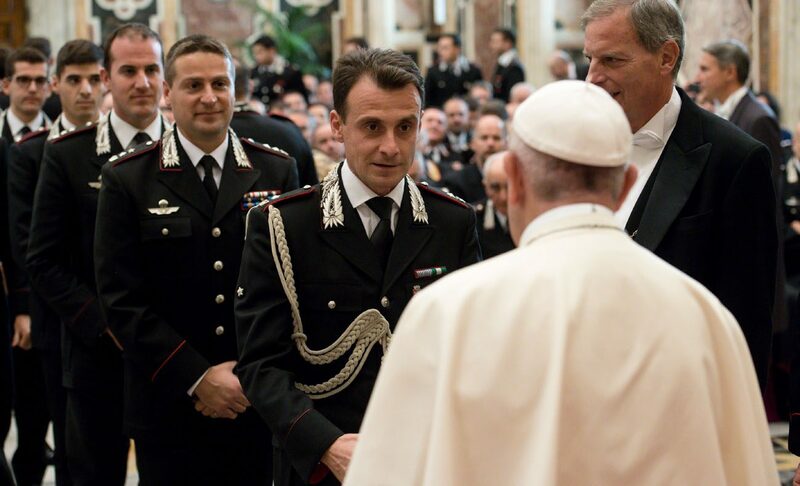 Pope Francis met Oct. 28 with the 150 conference participants and with 100 officer candidates from the Carabinieri. And while it is true that almost unimaginably horrible things continue to happen in situations of conflict, he said, it also is true that solidarity and charity are there as well. “There are many people, many charitable and non-governmental groups, within the church and outside it, whose members face difficulty and danger to care for the injured and the sick, to bury the dead, to bring food to the hungry and drink to the thirsty and to visit prisoners,” he said. Pope Francis prayed that all combatants and humanitarian workers would embrace the “fundamental principles of humanity, impartiality, neutrality and independence” in assisting the victims of war.